I am a bit late coming to the party but I've decided to join in the fun of the "52 Ancestors Weeks Challenge" created by Amy Johnson Crow, author of the blog No Story Too Small. The Challenge: Have one blog post each week devoted to a specific ancestor. It could be a story, a biography, a photograph, an outline of a research problem — anything that focuses on one ancestor. My Bryant family has been on my mind as of late since completing my recent post, A Little Boy's Story. It felt right to begin with someone associated with this line. This ancestor of mine was born an Ellison but most definietly died a Bryant. I think of her as "the heart" of my Bryant family who lived in Morehead City. Carolyn Ellison Bryant was my 3rd great grandmother. This is what I know of her life thus far. She was born in Beaufort County, North Carolina on August 4, 1844 to a Benjamin and Rosetta Ellison. From the research I've done, I've learned that Caroline's father, Benjamin, was a slave of William John Ellison of a place called Tranters Creek, just outside of Washington, North Carolina. I believe that Caroline was more than likely a slave of Benjamin's as well or one of the other related Ellison families of the area. 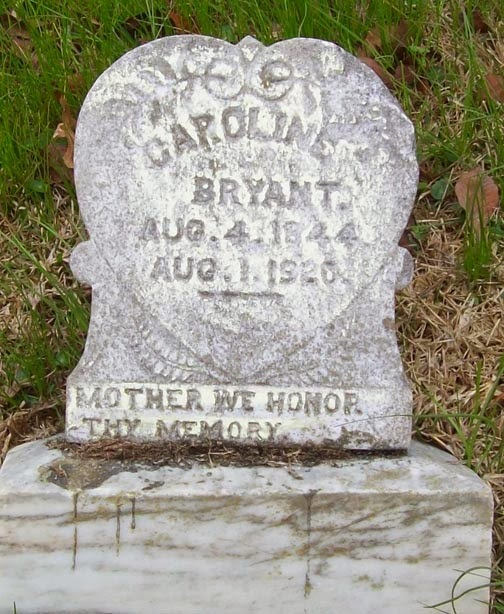 Caroline Ellison Bryant --my 3rd great grandmother. The Civil War brought major changes to the city of Washington, NC. The Battle of Washington took place March 30 to April 19, 1863. The Union occupied the town until they were forced to withdraw at the end of April 1864. William John Ellison, Benjamin's owner, died in March of 1862. These two events I think led to the family being split up during this time period. Some moved to Snow Hill, Greene County, NC, and others fled to Carteret, and Craven Counties. Yet a few remained in or around Washington, NC after the Civil War. Caroline Ellison made her way to the town of Beaufort in Carteret County, NC as evidenced by the registration of her marriage to Henry Bryan(t) on July 31, 1864. Source Information: Ancestry.com. 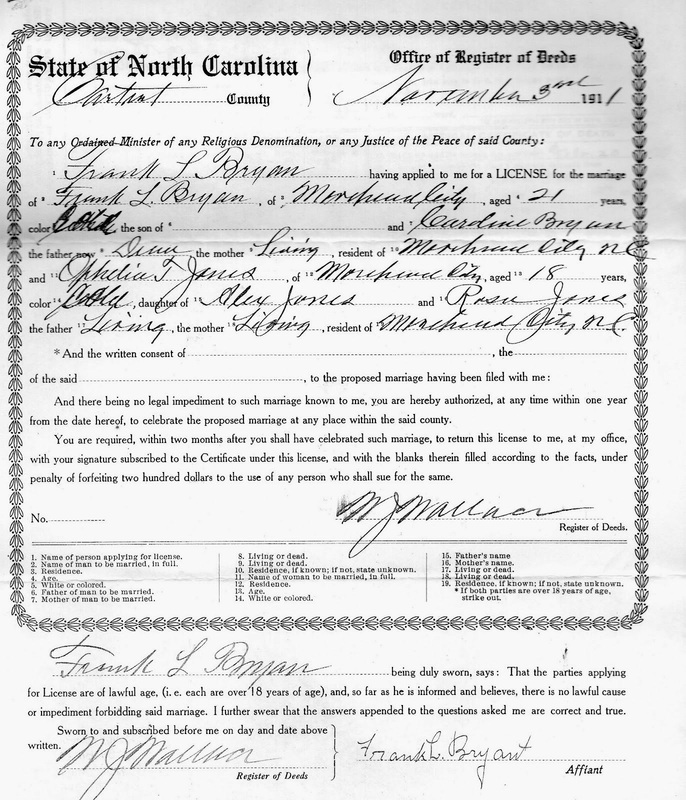 North Carolina, Marriage Collection, 1741-2004 [database on-line]. Provo, UT, USA: Ancestry.com Operations Inc, 2007. Image courtesy of the North Carolina State Archives, Raleigh, North Carolina. Caroline may have known her husband prior to coming to Carteret County. Perhaps when Washington, NC fell back into the hands of the Confederates, she made the move with Henry to somewhere they felt safe, Union occupied Beaufort. Source Information: Ancestry.com. 1870 United States Federal Census [database on-line]. Provo, UT, USA: Ancestry.com Operations, Inc., 2009. These for sure were not their first children. Henry was 39 and Caroline 23. How many children had they been separated from during the years they were enslaved? I think of a young Caroline still a child herself probably giving birth to her first at what 16, 15, or 14 years of age or worse younger. How much time did she get to spend with those babies? Who lived? Who was sold away? How often did she get to whisper to them the sort of wisdom a mother must share with her child? My heart breaks when I think of these questions. I can't imagine what it must have felt like to bear the yoke of all that heartache. Now, this family was a new chance. A fresh start. A time when she could see her babies grow up and have lives of their own. The void left from losing the others could be filled in just a little. Perhaps? When the 1880 Federal census came about, there were the additions to the family of Rose, Henry and John noted. Caroline had more love to pass out, more guidance to give and a busy household to keep up with. This was the last census Henry Bryant Sr. was listed on and the only one I could find Rose on. A husband and child would die before 1900. Source Information: Ancestry.com and The Church of Jesus Christ of Latter-day Saints. 1880 United States Federal Census [database on-line]. Provo, UT, USA: Ancestry.com Operations Inc, 2010. Caroline persevered on. She went from being a renter in 1900 to a property owner by 1910. She maintained her status of head of the household, guiding her daughter Jonas and her grandchildren William, Mamie (Mary) and Frank (my great grandfather.) Perhaps the private family she was working for in 1910 was the family of Charles Slover Wallace. My great grandfather Frank was employed as a butler for him in 1917 and later in life became his chauffeur. For more on who was Charles Slover Wallace, take a look at this post: Military Monday: Frank Bryant's World War I Draft Registration Card Provided An Interesting Find! Souce Information: Ancestry.com. 1910 United States Federal Census [database on-line]. Provo, UT, USA: Ancestry.com Operations Inc, 2006. I believe that Caroline was a woman of faith and it was her faith in God and her faith in her family that I believe sustained her during the hardest times. I recently found a newspaper article mentioning her and from it I learned she was also a member of St Stephen's AME Zion Church like many of my other Morehead City ancestors. First and foremost, I think Caroline was a mother. A mother to those who needed guidance. She was a mother to her grandson William Bryant since his mother, Rose, died sometime before 1900. She was there for her daughter Jonas and sometimes filling the role of mother with her grandson Frank when Jonas wasn't able to be there. At least that's how I see it. I get a sense of how things were when I look at certain records such as her grandson Frank's marriage certificate. Image courtesy of the State Archives of North Carolina. **Note Caroline Bryan(t) was listed as the mother of Frank L Bryan(t) on this certificate. Perhaps Caroline was the one who actually raised Frank and not his mother Jonas Bryant? Jonas made the move to Prince George, Virginia between 1910 and 1920. It must have been Caroline that Frank turned to for advice during the early years of his marriage since his mother was so far away. Caroline Ellison Bryant lived the rest of her life in Morehead City, NC. She died on August 1, 1920 just 3 days shy of her 76th birthday. Bayview Cemetery, Morehead City NC. 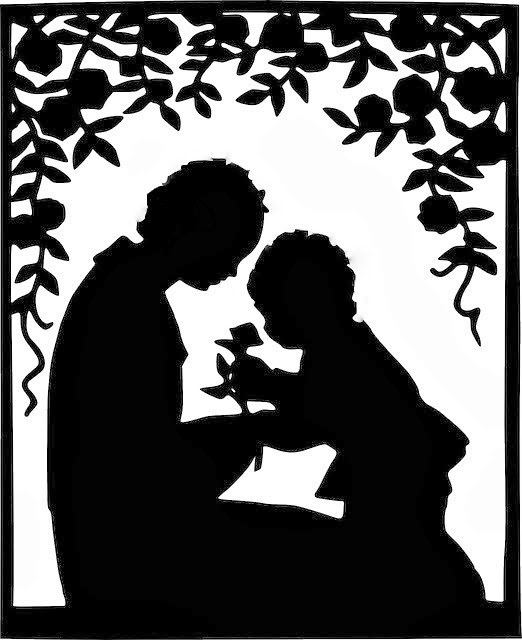 "Mother we honor thy memory." I don't know how I have been so lucky to find such things. I just feel compelled to share my ancestors stories since they have provided me with so much information. Have you been able to go to some of the places of your Ancestors? Mighty strong Woman in her own right. Yes True, I've been to Morehead City, Riverdale, and New Bern. I have to make a return trip there soon though. Still have family there and I want to do more research. It was quite an experience visiting Bay View Cemetery where Caroline and a lot of my ancestors were buried.